This plan is really for those who are still unable to change their imei and also to all those who are not using android devices. Basically this plan works on all platforms including your PC. At least you don't have to worry anymore about insufficient Data. Though this plan has been around for a very long time but it was initially #3000. Now the price has been reduced to #2,500 with the same 4.5gb data cap. => if you are not yet on the overload plan you can dial this code *200# to activate. And this gives you 200% bonus on recharge and data above #200 and #1000 respectively. 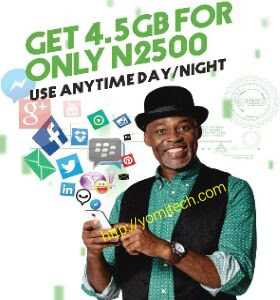 => load #2,500 into your Glo sim card and that should give you #7,500 which is 200% bonus of your recharge. => then dial *127*58# to activate the plan and you should be given 4.5gb. The good thing about this plan is that it doesn't come with any like the Mtn night plan. So you can use your data any time , any day 24/7 within the 30days validity period. For all those using the Mtn night plan you might want to think about migrating considering the fact that they are both capped at 4.5gb at the same rate of #2,500. I'm currently enjoying this Glo 4.5GB data plan especially the free bonus airtime that comes with it.